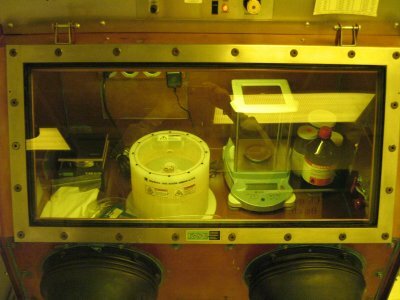 The glovebox is a nitrogen atmosphere system which creates an inert environment. The glovebox can be used for processes that require minimal exposure to water vapor, oxygen, or the user. The glovebox contains a Laurell Technologies WS-400B-6NPP Lite spinner and a CAT M17.5 Schott hotplate with stir feature. The spinner can be programmed with times up to 99 mins, speeds up to 6,000 rpm, and has a 1.75" (45mm) chuck for 50-150mm substrates. The glovebox is equipped with a multi-cycle loadlock to minimize contamination of the nitrogen environment. The glovebox maintains < 200 ppm water vapor, and typically can sustain as low as 60 ppm.